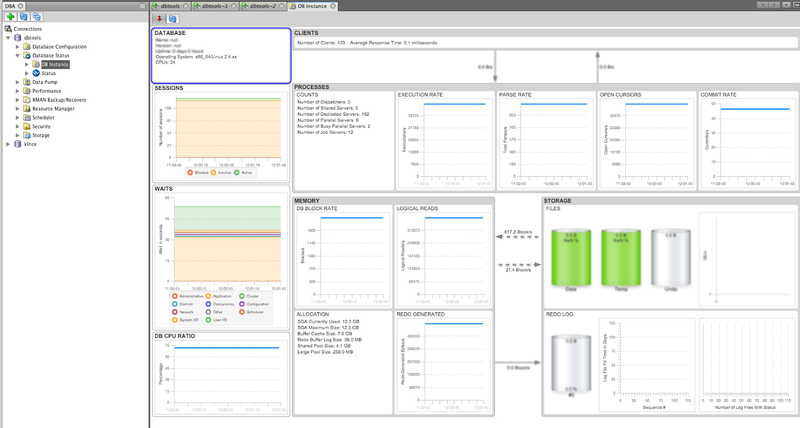 SQL Developer 4.1 is out for tire kicking. There's a lot of new things in there as well as some great enhancements. There's a nice shiny new Instance Monitor to get an overview of what's going on. Keep in mind this is in flux from a UI stance and the final may be quite different that what you see today. There's tons of data here and mostly all things have drill downs. Also, we took the sqlplus engine we have and built a command line for it and named it SDSQL. Someone will say this stands for sql developer sql but let's not dwell on names. This new command line has TONS of things in it. Please keep in mind this is an EA. The new command line is very very compatible with sqlplus in fact I alias sqlplus to my sdsql and that's all I use now. However, this is an EA and it is not 100% sqlplus and may never be there's some very odd old things that sqlplus does like did you know "SQL> #create table klr_1 ( id number );" works? Yeah , we're not doing that. Anyway, grab it, try it, see what you think. On the 4.1 download page there's a section for SDSQL. Just grab that and as usual just unzip and ./sdsql. This screenshot shows color coding and a nice compact printing of the results of a query. This results is buffered and the col headers are set to the max of the datasize completely ignoring whatever your linesize is set to. The catch is only 5k rows is supported since it's buffering. Query over 5k and you'll get a nice warm message that says unsupported. 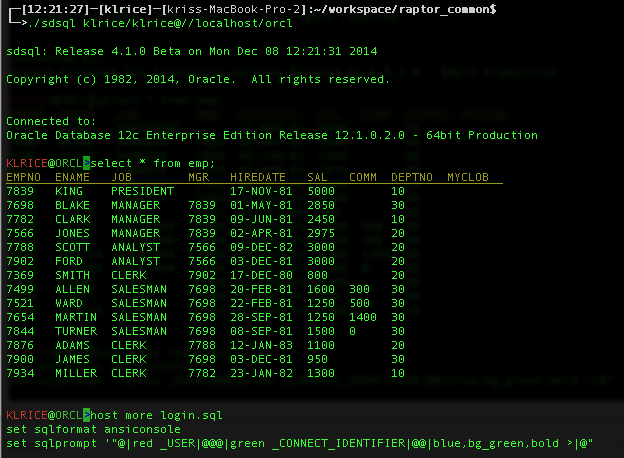 Here's my Login.sql if you want to try it out. 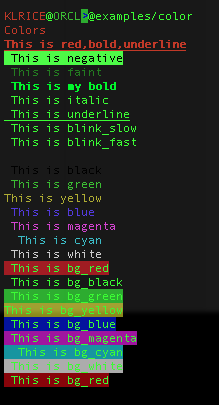 set sqlprompt '"@|red _USER|@@@|green _CONNECT_IDENTIFIER|@@|blue,bg_green,bold >|@"
If you want different colors, here's a script that shows a lot of the possibilities. And here's what you'll see from it.